your kitchen! As a doctor, he has a keen interest in helping others live as healthily as possible. 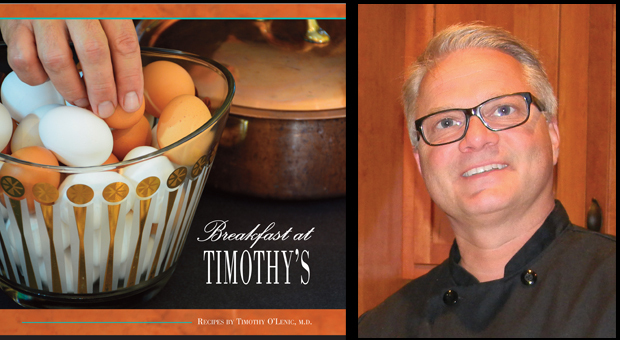 It’s true what they say, breakfast is the most important meal of your day, and Breakfast at Timothy’s makes it as fun and tasty as possible! “When you buy a cookbook, do the simplest recipe first.” (start with hard boiled eggs on page 12 and work up to Lobster Benedict on page 127)"
“Brunch, for me, is an extended breakfast that should be enjoyed whenever you have time properly to engage in cookingand eating...” (delight your guests with a Breakfast Quesadilla and Jeff Boardman’s Totally Bloody Mary)"
“Not eating breakfast is the worst thing you can do...” (what could be easier than Yvette’s Scrambled Eggs with Herbs on page 5)"
“I always cringe when people tell me they don't eat breakfast, as though that’s a good thing. Eek! You have to start the day off with something in your stomach to get your metabolism active.” (early morning work out? check out the preworkout smoothie on page 112)"
Author Avery Caswell is currently writer-in-residence at Lenoir-Rhyne University as part of their prestigious Visiting Writers Series.